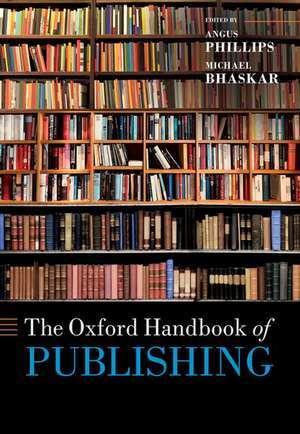 Angus Phillips is Director of the Oxford International Centre for Publishing at Oxford Brookes University. He formerly worked in the publishing industry as a trade editor at Oxford University Press. He has given talks and lectures about publishing all over the world and has carried out consultancy and training work with international publishers. He is a member of the European Advisory Board of Princeton University Press and was a judge for The Bookseller industryawards for four years in a row. He is the author and editor of a number of books including Turning the Page (2014) and Inside Book Publishing (sixth edition 2019, with Giles Clark).Michael Bhaskar is a writer, digital publisher, researcher, and entrepreneur. He is Co-Founder of Canelo, a new kind of publishing company based in London, and Writer in Residence at DeepMind, the world's leading AI research lab. He has written and talked extensively about publishing, the future of media, the creative industries, and the economics of technology around the world. He has been featured in and written for The Guardian, The FT, Wired and on BBC 2, the BBC World Service, BBC Radio 4and NPR. He has been a British Council Young Creative Entrepreneur and a Frankfurt Book Fair Fellow. Previous books include The Content Machine and Curation: The Power of Selection in a World of Excess.